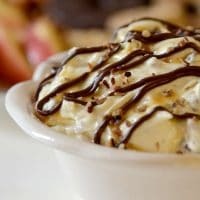 Turtle Cheesecake Dip has all the flavors that are in a Turtle Cheesecake, but it’s no bake and only takes a few minutes to make! This is a great recipe to have for a crowd and you can serve it up with many different sides. 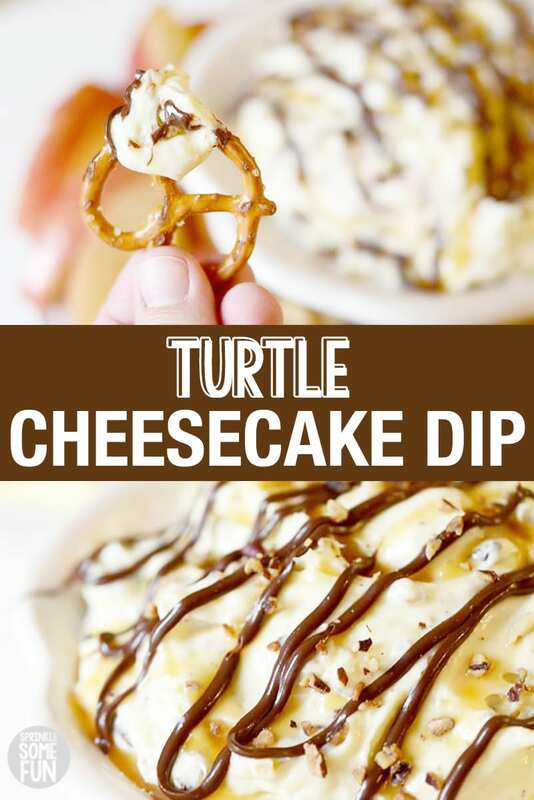 I created my Turtle Cheesecake Dip using Hershey’s™ Spreads as part of a sponsored post. When it comes to party planning I am always looking for delicious and easy dishes that I can whip up in no time. Easy recipes just make the day of the party so much more manageable. 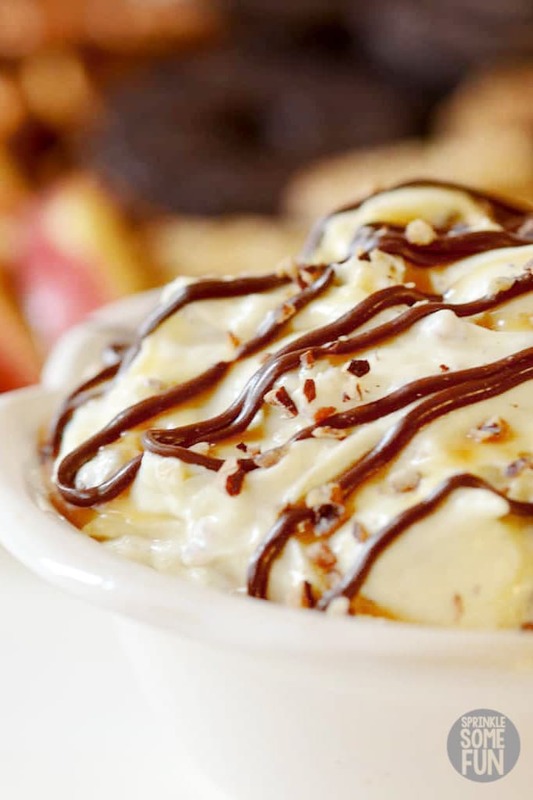 I used the new Chocolate Hershey’s™ Spreads to drizzle on top of this dip and the result was amazing! The Hershey’s™ Spreads come in 3 varieties: Chocolate, Chocolate with Almond and Chocolate with Hazelnut. I love them all and like to use them as an easy dip on their own especially with pretzels! I used the Chocolate, but you can use any of the flavors for an added twist to the dip! 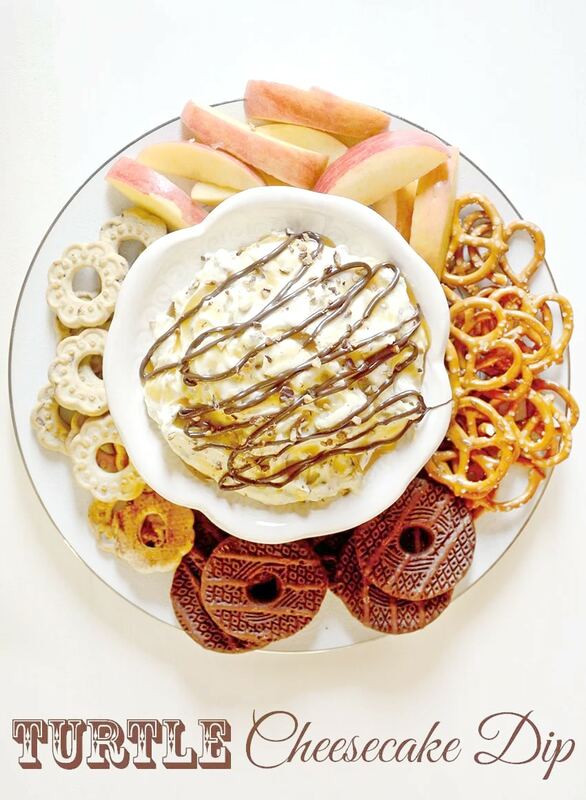 My favorite way to serve this dip is alongside assorted dippers like pretzels, apples, and cookies! I usually just put a spoon in the bowl and let everyone dig in! I can’t wait to serve this easy dip again because everyone raved about it! Place cream cheese, powdered sugar, pudding, and whipped topping in a mixing bowl and mix on high until mixture is light and fluffy. Add 1/4 cup of the toasted pecans and mix on low speed until evenly incorporated. 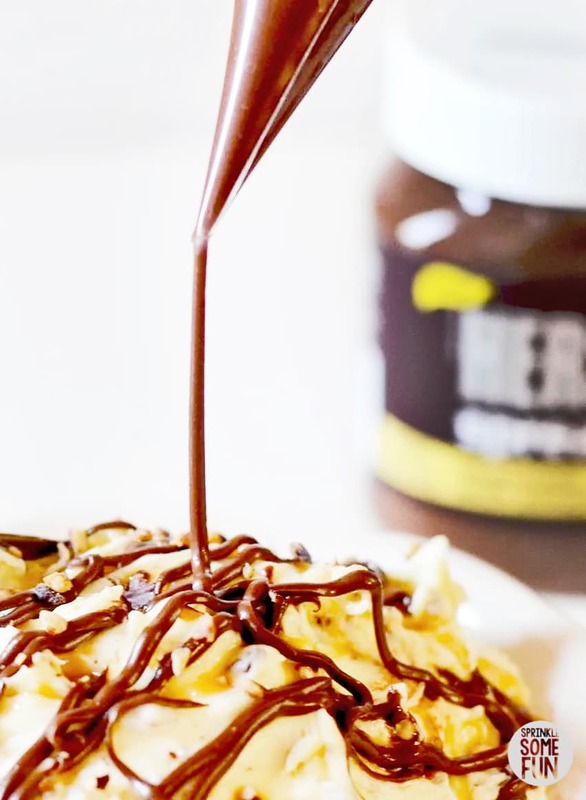 Place the mixture into your serving bowl and drizzle the Hershey's™ Spreads and caramel sauce on top. Sprinkle on the remainder of the toasted pecans on top and serve immediately or place in refrigerator up to 2 days. I love when we visit, Easy to prepare and delicious and cheap and delicious. This looks delicious! I think this will be great for Super Bowl weekend. Omg, Looks so amazing and delicious. I so cannot wait to make this one. YUM!!! Looks sinful… Can’t wait to try this out. 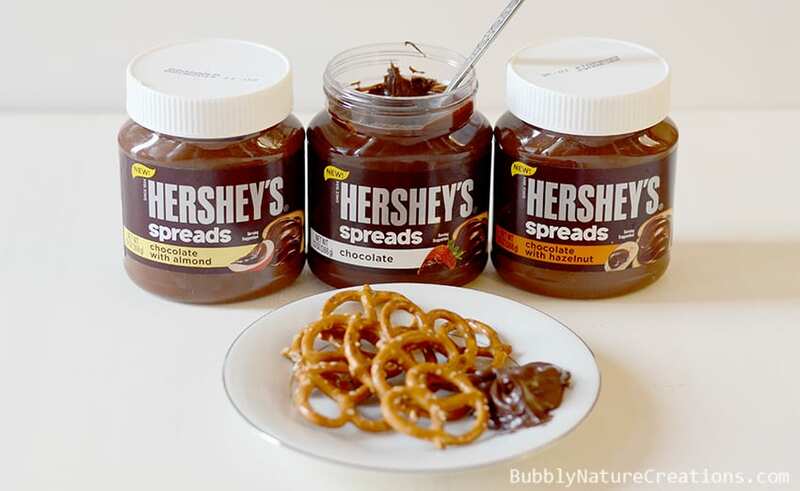 Where do you get Hersey spreads from? I’ve never seen them. Made this for July 4th and it was a huge success! Thanks for making me look so good and thank you so much for sharing. I will make again and again. Fantastic! I made this for a Superbowl party. It was voted the best new dish at the party!!! I’ve been requested to make it again for next week end. Thanks, we loved it!